Was unable to attend Saturday's auction that I first reported, City Auction, last month. A few people I talked to earlier this week told me that a couple hundred people showed. No mention in the local media about this. Spoke with a representative from the auction company this afternoon and was told that every property was sold. This includes of course 16 Harwood Place - went to Buffalo resident for $3800 and the Woodlawn Row Houses were sold, too. An out of state development company purchased them for $8500. All sales must be approved by the City according to the auction terms. Been following the recent life cycle of 2 Girard, that you see from the 33 along Humboldt Parkway. Recently posted here - Remember 2 Girard? - with all sort of links reaching back to March 2005 with photos and requests to stay the demolition. Learned today from frequent fixBuffalo reader that plans for the 2 Girard's revival appeared on Citi-stat last week. Submitted to Agency Members, for approval, is a request to contract with Fillmore Leroy Area Residents, Inc. (FLARE, Inc.) in the amount of $335,600 for the acquisition and rehabilitation of 24 Victoria Street and 2 Girard Place. FLARE has already rehabilitated four homes on Victoria Street and is looking to construct two new homes. Two Girard Place is located on the corner of Humboldt Parkway and can be seen from the Kensington Expressway when approaching downtown Buffalo. 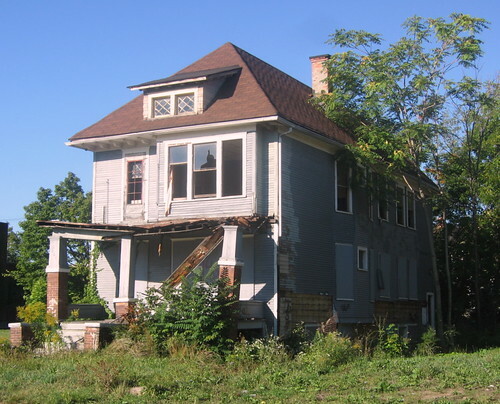 This home may be converted into a single family home if a previously interested buyer is still willing to purchase this property when rehabilitation is completed. 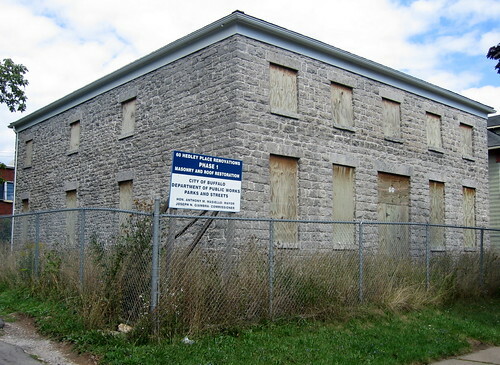 Mayor Brown praised this project noting that the Girard location is an eyesore in its present state. Ms. Yvonne McCray from FLARE gave a brief overview of the project. She added that through the CHDO funding, FLARE has been able to assist smaller groups and she thanked the Board for their support. If you've been reading fixBuffalo for any length of time no doubt you've seen various sets of interior views of the stunningly beautiful and collapsing Transfiguration Church. Interior video here, and archive over here that includes the cover story from a recent issue of Artvoice last month - Fall From Grace. Today begins another bizarre chapter in the pending collapse of this church. A west side activist passed along the following fund-raiser that she received in the mail today. The return address is the corporate address for local Buffalo based attorney William Trezevant, the presumptive owner of Transfiguration Church. And yes, there's still an outstanding Housing Court warrant for his mother's arrest from 2002. 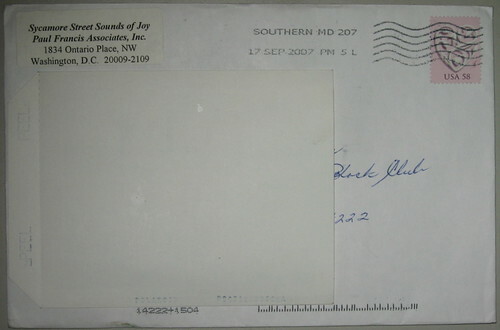 Don't know if the following mailing is intended as a legal defense fund or not. Assume so. Bill - I mean Paul Francis and Associates - is expected back in Buffalo's Housing Court next week - index# 409/2007. 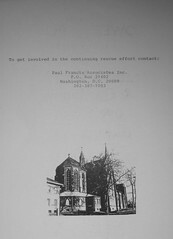 Strange that the mailing doesn't mention - some faded b&w pics, sure - Transfiguration by name. The fundraiser included packets of flower seeds you could purchase. I'm assuming Bill has a list of block clubs and is sending this to various groups. 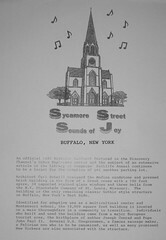 In about 15 seconds after publishing this post google will pick up - Sycamore Street Sounds of Joy - for the first time ever. Bizarre Bill, simply bizzare. See you next Wednesday in Court...again. Ever want to live in a firehouse or school? Here's your chance. Three fire houses and two schools are up for grabs. 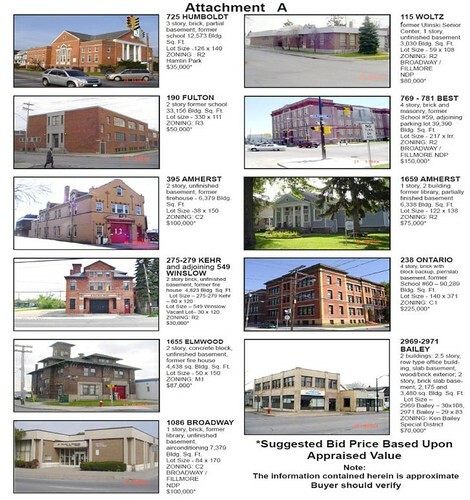 City of Buffalo - in addition to the Septemeber 22 auction, here - has published and RFP for the disposition of the following assets. RFP deadline is October 12th. Here's the link from the City's site to various RFP's. I've archived the October 12th opportunity - here - as the link seems to be migrating around the city's site and has been hard to find. While checking out some of the coolest city owned houses near Hamlin Park the other day we checked on this stone farm house at 60 Hedley Place. Neighbors told us that the project has been at a standstill for the last five years. Strange as it's right around the corner from Mayor Brown's residence at 14 Blaine. Anyone know more about this? Like to know. Oh, the two city owned houses we checked out, 16 Harwood Place and 1572 Jefferson. Harwood is up for grabs at the City auction this weekend - right here. The amazing house on Jefferson is City owned and was marked for demolition just recently, in August. Place I'd probably start if I were to do it all over again. 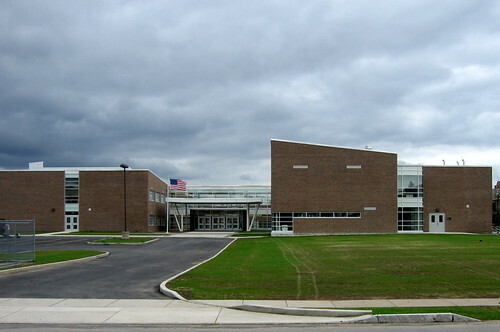 No mention in the Buffalo News this past week about the opening of the new permanent home of the Buffalo Academy for Visual and Performing Arts. Another Saturday tour of the Artspace Backyard Neighborhood. This morning a group of new UB students had the unexpected opportunity to catch a glimpse of a fifth floor loft courtesy of Kelly and her family who moved in recently. Here's Chris Hawley describing the unique urban character and importance of Coe Place. Chris wrote the City's planning document - Midtown Poised for Renaissance, two years ago. And he's still looking for interns over at Senator's Schumer's office. Interested? Contact Chris. After the tour Chris and I poked around the backside of Artspace. Really amazing space emerging. 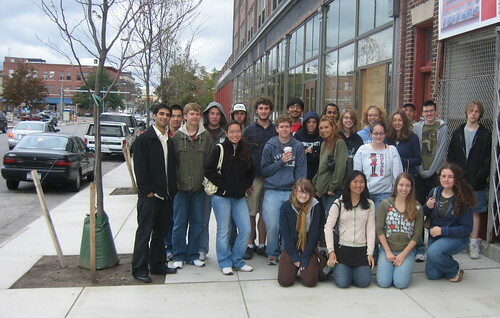 Tours every Saturday, meet-up at the Sonic Café, across from Artspace @ 11am. Received the following in the morning mail. Rather odd that it appeared the same day a New York Times piece covers the story and the National Trust for Historic Preservation is weighing in, too. The City will match you donations on a dollar for dollar basis. 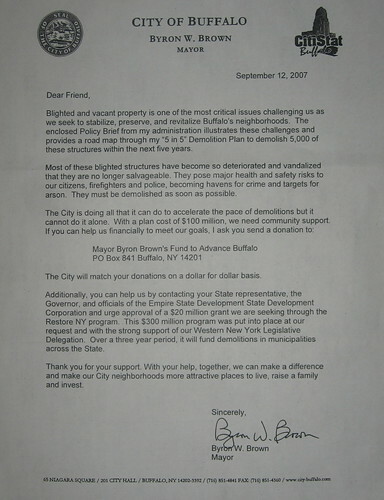 Here's the four page brouchure dated August 1, 2007 that was tucked in with Byron's "Dear Friend" letter. Two articles crossing my desk this morning. New York Times reporter Ken Belson contacted me a few weeks back. We met with a few other Buffalo lovers that I had assembled and headed out to tour some very familiar territory that fixBuffalo readers have been reading about for the last few years - the German Roman Catholic Orphan Home, Artspace, Coe Place and the Arts Academy neighborhood Cold Springs. 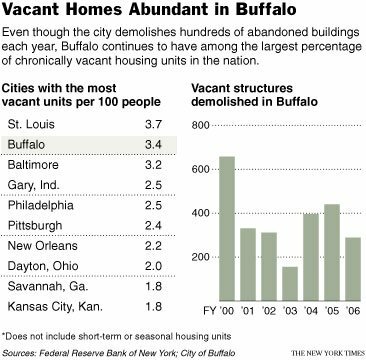 Ken Belson's article is in today's New York Times - Vacant Houses, Scourge of a Beaten-Down Buffalo. Of course many of the answers are spelled out very clearly in the path breaking work that the good folks at LISC - Buffalo assembled and presented - last November. 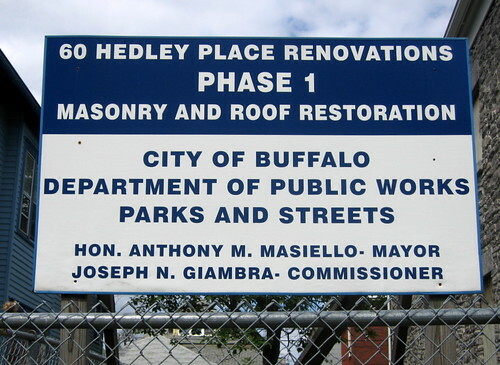 Read all about Blueprint Buffalo here, Getting Smarter about Decline. The second national article appearing in the latest issue of Preservation On-line from the National Trust for Historic Preservation - Winging it in Buffalo tells a similar story. There is no denying that Buffalo has seen better days. In the past 50 years, the city has lost some of its key industries, and, consequently, nearly half of its population. The result: tens of thousands of abandoned buildings. I had the opportunity to introduce National Trust representatives in June to the Queen City Farm project that's mentioned in the article. fixBuffalo readers will recognize this house as one that i placed on the local radar back in April 2006 - here. Check out the short Queen City Farm film in a recent post to learn more this project. Really very amazing. First started writing about 1466 Michigan, long time ago - here in January 2005 within the context of vacant houses surrounding City schools and again here, in April 2006 and most recently in February 2007, here. Problem of course is that no matter how many times I re-board and secure the back door, next time I check as I did early this morning, it's wide open. The larger problem is that it's part of a pattern of neglect. It probably doesn't take an advanced degree in urban planning to understand the importance of developing a well integrated plan to either moth-ball structures such as this - new roof went on a few years back - for the market to catch-up to the supply of structurally solid houses such as this - or, to demolish it. It's City owned and sits directly outside my office window. Should have been listed for the special City Auction later this month on September 22 - details. Not a spectacular or architecturally significant spot, straight Buffalo three bedroom upper/lower house. Contractor friends say 50-60K to whip it into habitable space. Stranger still is that it sits less than half a block away from the newly renovated Arts Academy, crown jewel in the recent joint school reconstruction project. Sort of fits in with other houses in the neighborhood, owned by Rev. Stenhouse - secretary/treasurer of Buffalo's Control Board - see Controlled Plan? Same problem exists in other neighborhoods, too. School House Project, from March 2005 is my first attempt to get my arms around this issue. Meanwhile here's a map showing proximity of 1466 Michigan to the new Arts Academy. Quick scan of the real estate transaction section of yesterday's Buffalo News - amazing weekly read if you're considering Buffalo for the first time - right here revealed that the St. Matthew's Church at 1066 East Ferry Street has a new owner. fixBuffalo readers will remember the un-folding drama involving a Good Friday urbex moment that morphed rather quickly into some negative press for the recent former owners of St. Matthew's. Background - here. Haven't heard yet about future plans. Updating soon. update 2pm...this may have more to do with another building that was part of this campus. Still verifying. Here's the piece from yesterday's Buffalo News which I also received from an East side housing activist earlier this morning, too. 26 Wyoming, St. Matthews Roman Catholic Church of Buffalo NY to Vesta Community Housing Development Board Inc., $60,000. 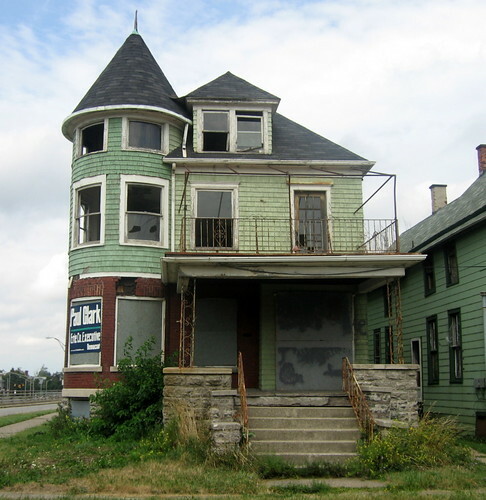 fixBuffalo readers have been following the emerging Shrinking Cities critique and very intelligent right-sizing and green strategies of another devasted rustbelt city - Youngstown, OH. Eariler today a frequent fixBuffalo visitor passed along the following article - Small is Beautiful , Again - from a recent issue of Shelterforce Online. No community developer likes to be told that the housing she just built was "not doing anybody a favor." But that's what Jay Williams, the young, incredibly popular mayor of Youngstown, Ohio, said to Governing magazine last fall about much of the low-income tax-credit housing built in his city over the past decade. Shelterforce Online is published by the National Housing Institute. Shelterforce is the nation's oldest continually-published housing and community development magazine. 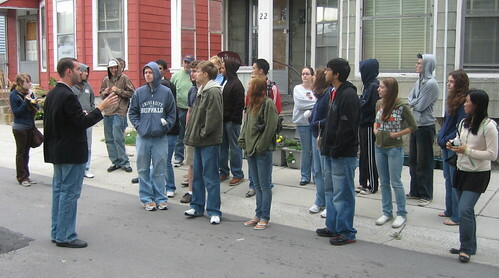 For three decades, Shelterforce has been a primary forum for organizers, activists and advocates in the affordable housing and neighborhood revitalization movements. Smart City is a weekly, hour-long public radio talk show that takes an in-depth look at urban life, the people, places, Create Documentideas and trends shaping cities. Host Carol Coletta talks with national and international public policy experts, elected officials, economists, business leaders, artists, developers, planners and others for a penetrating discussion of urban issues. Rarely do we get a good news story about teenagers. But this week is different. Teens in Memphis, many living in public housing, spent the summer mapping their neighborhood and its assets. And even they were surprised by what they learned. We'll talk to Dr. Charlie Santo from the University of Memphis who designed and directed the project. Dr. Santo is Assistant Professor of City & Regional Planning in the School of Urban Affairs & Public Policy. Also with us is Wayne Senville who spent his summer traveling Route 50 from Maryland to California, talking to citizens and planning commissioners in towns along the way. Wayne is editor of the Planning Commissioners Journal and plannersweb.com. Very cool tour late yesterday afternoon of the Artspace Backyard Neighborhood in Midtown, Buffalo. Brand new UB students got a first hand look at this emerging arts and education destination and had an opportunity to chat with Roy & Jen over on Coe Place. Chris Hawley from Senator Chuck Schumer's office joined us, too. Chris just informed me that he has a number of internship openings available here in Buffalo working for Senator Schumer. Interested? Contact Chris. First one in the local 'sphere to be writing and tracking Artspace, ever since December 2004. Huge fan. Yet, I'm increasingly concerned about a few things, that came in to focus this afternoon. Last evening fixBuffalo fan tipped me off to a Craigslist add for rentals here at Artspace, when I went to show that this afternoon, it had been pulled. Then, I started paying more attention to the comment stream from a recent Artspace post - Behind Main Street - from a few weeks back. Especially these two comments here and here. Later this afternoon and talking with a few people about what this might mean, I was directed to a short article in the Hartford Courant - Artist Housing Threatened - from last week. One of the effective tools for reviving cities has been the use of subsidized housing for artists. Unfortunately, that tool is now threatened. 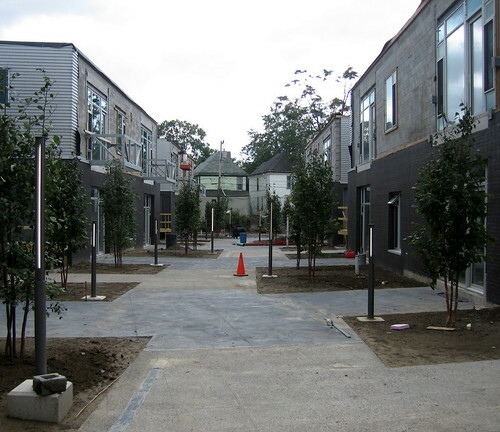 Mimicking the movement of artists to neighborhoods such as Greenwich Village in years past, federally subsidized artist housing is helping revive three dozen cities in 19 states, including four ArtSpace projects in Connecticut. The projects bring stimulating and diverse "creative class" talent to downtowns, preserve historic buildings, anchor or augment urban arts districts, and provide useful space for art and community activities. The IRS said ArtSpace violated a rule against renting units to a "social organization," making them unavailable to the general public. Meanwhile the construction delays on Main Street are mounting and hearing that there is now growing concern amongst investors regarding their investment, as well. I spent some time floating along the Buffalo River the other day, heading up river. Two weeks ago I posted Canoe and the City two weeks and included views of the Erie Canal Harbor development and links to other paddles along the Buffalo River. The introduction [full text .pdf] to Reyner Banham's Concrete Atlantis (1989) is a must read if you are interested in understanding this space along the banks of the river flowing through our City. Here, Banham quotes Eric Mendelsohn writing to his wife back in Berlin after visiting Buffalo in 1924. Mountainous silos, incredibly space conscious, but creating space. A random confusion amidst the chaos of loading and unloading of corn ships, of railways and bridges, grain monsters with live gestures, hordes of silo cells in concrete, stone and glazed brick. Then suddenly a silo with administrative buildings, closed horizontal fronts against the stupendous verticals of fifty to a hundred cylinders and all this in the sharp evening light. I took photographs like mad. Everything else so far seemed to have been shaped interim to my silo dreams. Everything else was merely a beginning. A number of David Plowden's photographs include Buffalo based boats and views related to grain transhipment along the Buffalo River. If you haven't checked out Buffalo History Works Grain, you should. Richly detailed descriptions of the the grain elevators including Cargill and Concrete Central. Best map, from 1931. At the end of the paddle we made our way back to McCarthy's and became oblivious to the Chicken Wing Festival happening a few blocks away. Next stop and further up river, Concrete Central.